Lower mortgage rates and bigger inventories are helping to spur housing sales. The Pending Home Sales Index jumped an unexpectedly large 6.1% to 103.9 for May, according to a National Association of Realtors (NAR) report released today. After inching up a lackluster 0.4% for April, analysts had expected stronger numbers for May. However, their 1% estimate proved far too conservative for May's major leap. 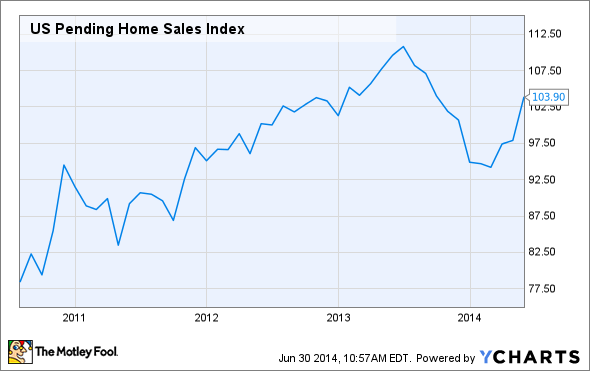 Compared to May 2013, pending home sales are still down 5.2%. The index is based on contract signings (with sales usually finalized one to two months later) and is benchmarked to 2001 contract activity. (An index of 100 is equal to the average level of contract activity during 2001, which was the first year the association examined data). NAR chief economist Lawrence Yun noted this latest report's numbers are most likely the new norm, rather than an anomaly. "Sales should exceed an annual pace of five million homes in some of the upcoming months behind favorable mortgage rates, more inventory and improved job creation," Yun said in a statement today. "However, second-half sales growth won't be enough to compensate for the sluggish first quarter and will likely fall below last year's total." Reports last week on new-home sales and existing-home sales provide further evidence that the housing market is on the rise, welcome notes for investors who've seen this sector as a drag on an otherwise increasingly strong economy. Looking ahead, the NAR expects the median existing-home price to grow between 5% and 6% for 2014, and 4% to 5% the year after. Existing-home sales are predicted to head in the opposite direction, dropping 2.8% from 2013 to 2014.